Bad Daddy’s Burger Bar has been on my radar screen for a while. After a recent visit to the Morrisville location at 3300 Village Market Place, I only wish I had gone sooner! 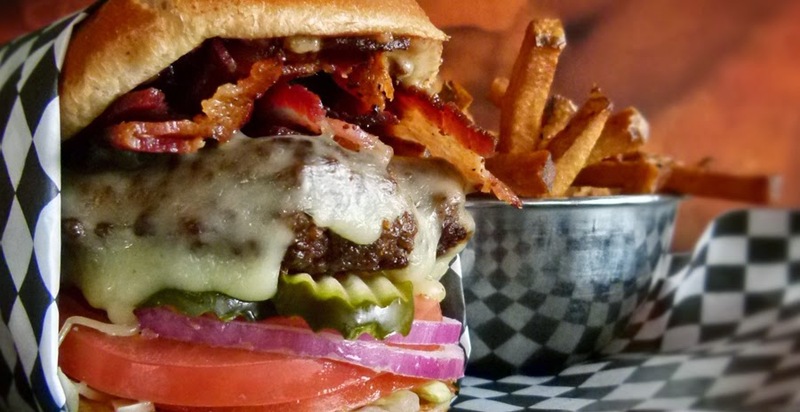 Bad Daddy’s specializes in high-quality burgers with tantalizing toppings. It’s hard not to be impressed with burgers made from chuck and brisket. Burgers run the gamut from basic to “Bad A**.” A create-your-own option starts with a 7-ounce patty and includes your choice from 10 varieties of Boar’s Head cheese plus premium toppings such as avocado, buttermilk fried bacon and rosemary ham. Among the various specialty burgers, I recommend the classic Southern burger with American cheese, chili, slaw, mustard and relish. It’s a messy proposition, but thankfully there’s a roll of paper towels on the table. For something decidedly different, try Mama Ricotta’s burger with fresh mozzarella, pesto, tomatoes, pepperoncini and extra virgin olive oil. Standout side items include hand-cut French fries, onion straws and house-made potato chips. I opted for sweet potato fries served with chipotle ranch for dipping, which were as tasty as I’ve ever encountered. Décor tends toward modern casual. High ceilings with exposed ductwork work nicely with the wide-open dining room. Service is friendly and efficient, and I would have been even more impressed if a manager had come by the table to ask how everyone enjoyed the dining experience. A meal with drink at Bad Daddy’s will set you back about $15. That's somewhat pricy, but it’s well worth the investment. nike free run australia sale Sister next nike free run australia sale door in the name of rogue sale cheap bad idea, and we are very pleased cheap next door sister nodded said, Well, what movie to see. Do nike free og 2014 sale not tell me to nike free run australia sale see the apple of love. The kind of garbage I do not watch nike SB Stefan Janoski Max sale movies, nike free run australia sale I can not stand it that cause vomiting dialogue. island to look to see, empty, the . Louboutin soldes en ligne You can really brave, Louboutin soldes en ligne unarmed from a high place then climb down, and Louboutin soldes en ligne also carrying your girlfriend. I want a man to climb down alone http://www.tangora.fr requires a lot of courage and strength, you have to carrying your girlfriend, you have not considered Louboutin soldes en ligne dangerous, if you did not do a good job Louboutin Pas Cher would not let your girlfriend fell off it .